Dual solenoid with manual override, 120 V.
The diverter gate offers high operating efficiency and long life. Body, end plates, and gate are rugged castings, fully ribbed to ensure dimensional stability. The body and diverter gate are machined to close tolerances to prevent leakage and ensure smooth operation. Bearings are of the non-lubricating type. Lip-type shaft seals provide gas-tight performance. This product is available in either Class 50 cast iron, 319 aluminum. Bearings are Oilite® bronze, and lip seals are nitrile. Other seal materials are available. Temperature limitation Standard gates are suitable for material temperature up to 225°F (107°C). Body –Durable cast iron construction. Disc –The internal mechanism works on the sliding disc and port principle. Hardened seats and discs resist abrasion and are lapped to maintain a positive seal at the closed port. Motor –Motor operation features a built-in mechanical brake for accurate positioning of the valve seal disc. 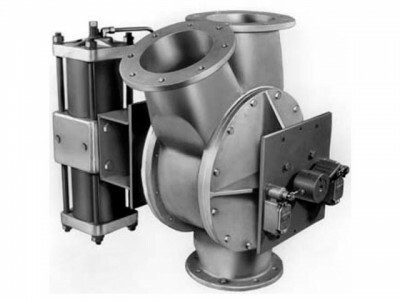 The FLSmidth Swing Gate is a manually operated, self-locking discharge valve. in an open position it presents minimum obstruction to dust discharge flow. This gate features a post-center toggle locking device. The body is a single, cast iron unit that is designed to create an airtight seal with the swing-gate seal. The Swing Gate is mechanically tensioned against the body valve seat using a gasket. Rubber gasket permits use up to 250° F (121° C). Special silicone seal gasket extends operating range up to 400° F (205° C). The FLSmidth Two-Gate Valve provides a dual-gate airlock seal against a differential pressure up to 17” W.G. and will withstand material temperatures up to 400°F (205°C). For material temperatures to 700°F (371°C). special motors and heat shields can be provided at extra cost. The valve body is constructed of seven (7) gauge fabricated steel plate. Inspection plate cover permits easy service access. The FLSmidth Two-Gate Valve has two (2) sealing gates which alternately open and closes as material passes through the unit in order to maintain a seal between material inlet and outlet. The alternating cycle is mechanically operated using an eccentric and gear motor arrangement. Simple gravity release produces non-jamming return operation. Steel gates are mounted on a finished shaft rotating freely on outboard self-aligning ball bearings. Motor Gear motors are TEFC, 3 phase, 230/460 Volt AC, 60 Hz. The FLSmidth Trickle Valve is an adjustable, counter-weight discharge valve which automatically responds to flap gate imbalance by releasing collected material. Good for applications up to 400° F (205° C). The body is durable twelve (12) gauge steel plate construction. Simple design presents minimum material restriction. Constructed of steel plate, the flap gate is gravity-operated with an adjustable counterweight. The flap gate is mounted on a finished shaft and rotates freely on outboard, self-aligning ball bearings. The FLSmidth Type SK One-Way Cutoff Valve is available in six basic sizes. The 3 through 6-inch (75 -150 mm) valves match the I.D. of standard Schedule 40 pipe. The 8 and 10-inch (200 and 250 mm) valves match the I.D. of standard Schedule 30 pipe. Operating temperature up to 400° F (205° C). Durable machined cast iron construction. The valves employ replaceable hardened seats and discs, ground and lapped to ensure positive sealing. Air cylinder actuator provides fast and positive cutoff operation. 50 to 100 PSlG (3.5 to 7 Kg/cm2) clean plant air required. FLSmidth is proud to offer a new line of high quality butterfly valves to meet the requirements of today’s market. Combining years of field application experience in the minerals and cement markets, with research and development, FLSmidth has designed many unique features into the valve, resulting in longer service life, greater reliability, ease of parts replacement and interchangeability of components.